Your product will need to have a price, preferably a no-brainer price. And at this price, your company will need to be able to cover ALL costs and make a reasonable profit (like 20%). See this page for a discussion of ALL of the costs. The amount of money that you spend on ads to get one customer needs to fit comfortably within the price customers are willing to pay. If any of these six points fails, then it is quite likely that your idea will fail in the marketplace. On the other hand, if you can get all of them to work together, then it is quite likely that you have a Reproducible Business Model (RBM) and you can scale it up for a win. So you want to test all of these things at some level during the prototyping phase to make sure that your idea will work in a financial sense. If you plan to sell a physical product in retail stores, your price needs to accommodate the keystone pricing model (or similar) often seen in retail channels. In keystone pricing, it means that you have a COGS (Cost of Goods Sold) which you double to set a wholesale price, and then the retailer doubles the wholesale price to set the retail price. If your COGS is $25, then the MSRP price in a retail store will likely be $100. Are customers willing to pay $100 for your product? If not, then either: 1) this product won’t work without lowering COGS), or 2) you will have to limit yourself to a direct sales model rather than appearing in retail stores. Bottom line: If you cannot get people to buy your thing at a price that covers all of your costs plus a profit, then your thing probably will not work. You will not be able to scale it up, and in your evaluation phase you will have to kill it. If you have a direct sales model for a product or a service, then you will probably want to use ads to drive people to your web site. If you have to spend $50 in ads to get one person to buy your thing, and the highest price customers will pay is $40, then obviously your thing will not work. You are losing money on every sale. How can a small pillow cost $60, or a king size pillow cost $150? All that it is is a cloth sack filled with buckwheat hulls. The answer, quite likely, is that it costs a lot of money in terms of advertising to get a person to actually buy a buckwheat pillow. And the price needs to be high enough to recover the advertising cost. Here they are trying to softwen the blow of an $80 price with a 2-for-1 deal. It probably costs $5 or less to make a pillow, so from the company’s side the COGS does not go up by much when offering 2-for-1. 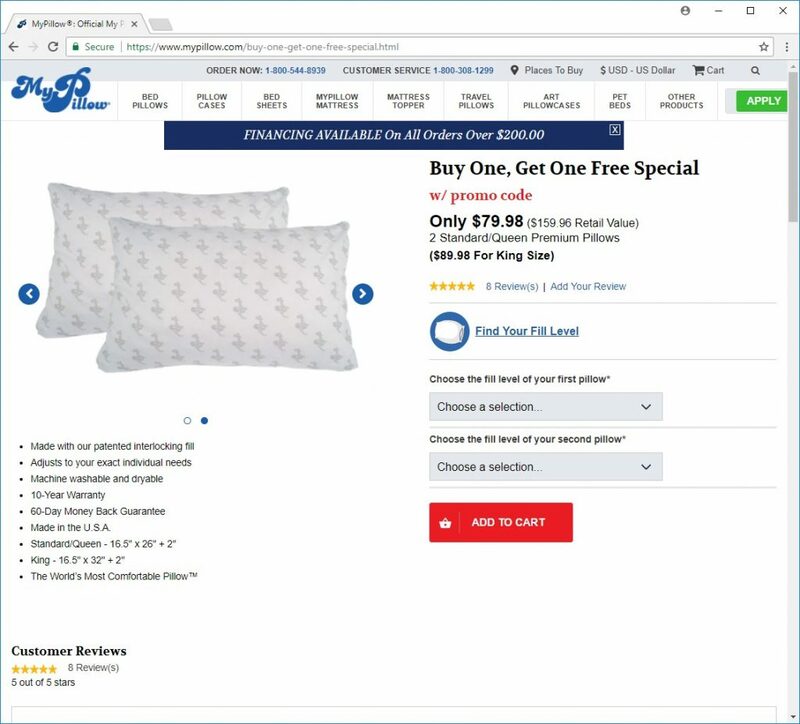 But MyPillow is spending a lot of money on ads (e.g. on talk radio and the Internet), and the cost of the ads must be recovered in the price. If people looked at the $80 price and said, “ain’t no way I’m payin’ that”, then MyPillow would not work as a product. You need to prototype your pricing and make sure people will pay it. 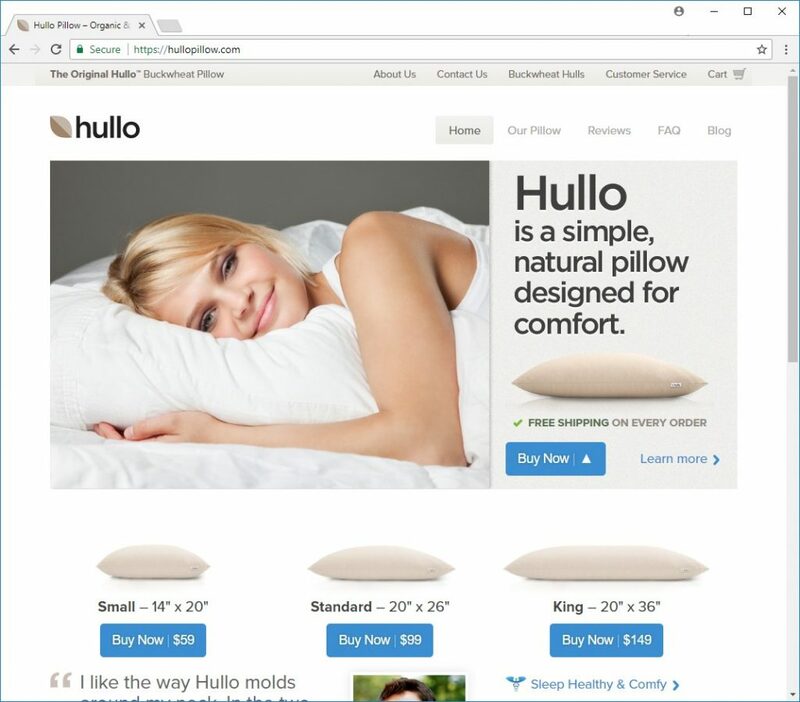 Both HulloPillow and MyPillow have a similar value proposition: “You will sleep better with this pillow”. If this value prop did not work, meaning that if people heard the value prop and did not come to the site to buy, then either: 1) the company would have to prototype other value props to find one that works, or 2) the company would have to abandon this product idea. That value proposition is pushed out to the audience using advertising: web ads, radio ads, print ads, billboard ads, whatever. These ads cost money. The cost of different ads can be wildly different depending on several different factors. A radio ad at 3AM costs a lot less that one at 3PM. An ad on a billboard in NYC costs more than one on a country road with a lot less traffic. And so on. Google ads pricing can change depending on the volume of ads you need and the position you desire. You need to find ads that work at a price point that works. As long as the CAC can be accommodated/recovered within the price of the product (along with all of the other costs + profit), then this is a win. On the other hand, if the CAC is too high, then this ad campaign does not work, and either: A) they need to try a different ad to try to improve sales and lower the CAC, or B) improve the conversion factor on the web site to improve the CAC, or try a different sort of show besides Monday Night Football, hoping to get a better response and lowering the CAC, or D) they need to try a different medium besides TV ads, or E) if everything fails, they need to abandon the product idea. If the idea cannot support a price that covers ALL costs plus profit, then it is not a valid idea. It is best to figure this out during the Prototype phase of IPESSI.